This Eataly Chef Plates 1400 Dishes a Day. How Fit Does that Make Him? 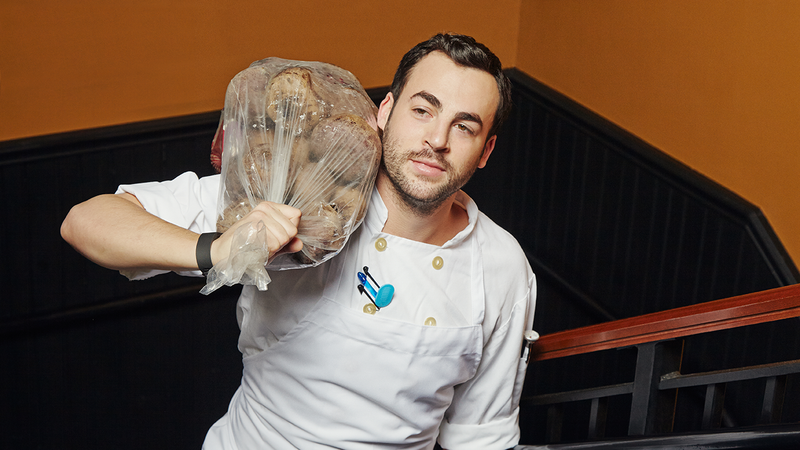 As a sous chef at Eataly's La Birreira, Mike Ran doesn't spend much time sitting around. Whether he's in the kitchen, checking deliveries, or hauling stuff up stairs, he's moving. But, Ran, who grew up playing football and basketball, had no idea how much activity he was really getting in the course of a day. In this series of five posts, normal people with naturally active lifestyles will inject a fitness boost into their routine using the Fitbit, complete with exercises anyone can do to make every day a workout. To keep up, start here for the basics, then check back here in the coming weeks as more posts with custom, gym-free workouts are added. This week: Mike Ran, Sous Chef at La Birreira at Eataly. Ran spends his whole day on his feet, moving around a busy kitchen, hauling 40-50 pound boxes of food, and traveling up and down stairs. He also makes a point of walking a mile-and-a-half to work every day. But on days off — Sundays and Mondays — he usually finds himself in front of the TV, watching football. Even with all that moving around, Ran was genuinely surprised when he spent a day wearing a Fitbit Charge™, and saw exactly how it all added up. In one day, he had taken more than 18,000 steps over 8.16 miles, and had burned more than 3,474 calories — blowing past the 10,000 daily steps recommended by experts. After seeing exactly how much he was already doing for himself during the workweek without even trying, Ran was inspired to push himself even further, in an effort to balance out all those Sundays and Mondays spent on the couch. So Ran asked certified personal trainer Chris Hale, of Awakened Nutrition and Training to offer advice. After looking at his Fitbit metrics and talking to him about his goals, Hale put together a set of exercises to increase Ran's core strength and mapped out a cardio and strength-training plan to make fitness an even bigger part of his everyday life. When performed in conjunction with a Fitbit activity tracker, Ran can use these exercises to send his already-awesome routine into overdrive. Wanting to help Ran find ways to take his already active day and fit in even more exercise, Hale put together two separate simple regimens — one for the workday, and one for home — that focus on small tweaks to help him get the most benefit from the stuff he's already doing. The home exercises focus on core-building, while the workday stuff is for cardio. Note: Keep your Fitbit counting so you can see exactly what you're accomplishing and start keeping track of improvements. Instead of walking to and from work, start running. Time the run, and, each week, try to beat your previous week's time. If you live somewhere with stairs, or work someplace that does, congratulations: you're the owner of some extremely effective exercise equipment. Make use of it. Whenever you need to go up or down the stairs during the course of your day, make a habit of adding an extra flight in, just for the exercise. Better yet: when you've got a few free minutes, or are feeling antsy, blow off some steam with a few stair runs. Lucy Maher is a digital media executive with 15 years reporting, writing and content strategy experience. Her work has appeared on SELF.com, MensJournal.com, Details.com, CNBC.com, and in The New York Post and the New York Daily News. This post is a sponsored collaboration between Fitbit and Studio@Gawker .